When you see this sign… keep on going. It was at the end of my journey .. almost. Weary and tired in the early hours of the morning all I could think of was a hotel room and a hot shower. I pulled into a lit up prairie town and was sure I’d find something comfortable. I spotted The Avenmore Hotel on main street.. it reminded me of something from the wild west.. they even offered a Black Gold Saloon! You had to go through a bar to get to the bartender who apparently was doing the room bookings.. sure he had a room! Gave me a key and told me to go to the back parking lot. By this time I’m apprehensive.. 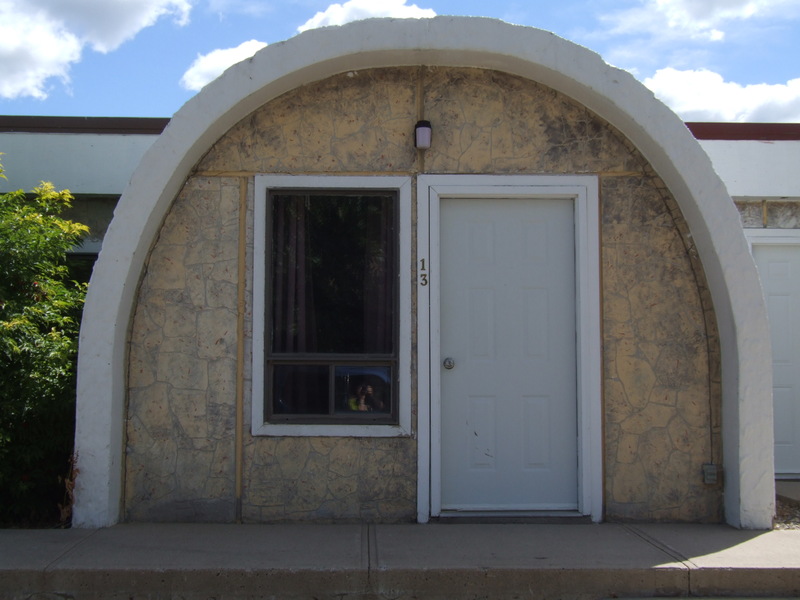 I pull up in front of little cabana style rooms that are shaped like igloo’s. I had to literally rub my eyes to believe what I was seeing. I get to my designated “igloo” and open the door.. sprawled on the bed is a gentleman with empty liquor bottles around him and he jovially shouted at me to come on in. I think at this point my heart literally skipped a beat! I quickly closed the door and headed back to the bar and asked the bartender what was going on. It turns out all the rooms were full and nothing was marked on the books. He muttered something about someone having their own deals going on and he wished he could have been informed. He refunded my money which in my opinion was literally highway robbery. It would have been cheaper to stay at the Hilton..if there had been one! My adrenalin kicked in and I felt like I had just downed six cups of coffee.. I knew I had to get the hell out of Dodge.. quite literally. Take note self.. when you see an igloo, speed up. When you see a sign that says the Motel 18 ..keep on driving. This entry was posted in love and poetry and tagged Carnduff, Motel 18, Sask, The Avenmore Hotel Carnduff. Bookmark the permalink.